Pack of 10 Tags (£6.95)Pack of 50 Tags (£29.95)Pack of 100 Tags (£59.95) + 100 FREE CABLE TIES! The most cost effective, heavy duty, chemical resistant, tear proof Lock Tags available. Exclusive to Fabufacture, these Lock-Out Tag-Out Tags are the most widely used LOTO tags available. Our Lock Out Tag material is a Strong, Tear Proof, Water and Chemical resistant 75 gsm thick plastic, suitable for both indoor and outdoor applications. 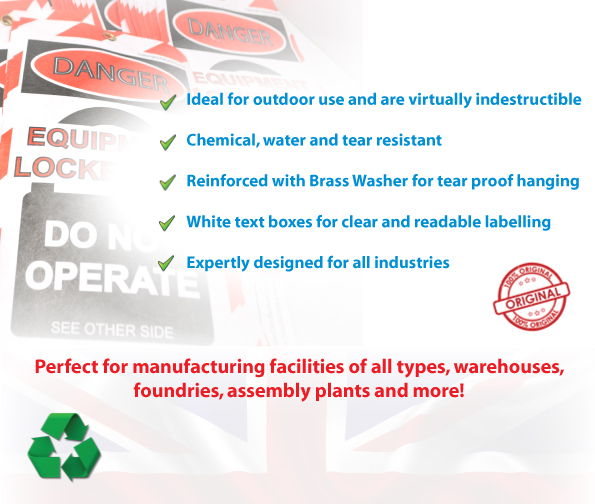 Our Lock Out Tag Material is 100% recyclable and can be used again in a wide range of products. Lockout-tagout (LOTO) or lock and tag is a safety procedure which is used in industry and research settings to ensure that dangerous machines are properly shut off and not started up again prior to the completion of maintenance or servicing work. It requires that hazardous power sources be “isolated and rendered inoperative” before any repair procedure is started. “Lock and tag” works in conjunction with a lock usually locking the device or the power source with the hasp, and placing it in such a position that no hazardous power sources can be turned on. The procedure requires that a tag be affixed to the locked device indicating that it should not be turned on. When two or more subcontractors are working on different parts of a larger overall system, the locked-out device is first secured with a folding scissors clamp that has many padlock holes capable of holding it closed. Each subcontractor applies their own padlock to the clamp. The locked-out device cannot be activated until all workers have signed off on their portion of the project and removed their padlock from the clamp. In the United States a lock selected by colour, shape or size (e.g. red padlock) is used to designate a standard safety device, locking and securing hazardous energy. No two keys or locks should ever be the same. A person’s lock and tag must not be removed by anyone other than the individual who installed the lock and tag unless removal is accomplished under the direction of the employer. Employer procedures and training for such removal must have been developed, documented and incorporated into the employer energy control program. The locking and tagging of the isolation point lets others know not to de-isolate the device. To emphasize the last step above in addition to the others, the entire process can be referred to as lock, tag and try (that is, try to turn on the isolated equipment). In industrial processes it can be difficult to establish where the appropriate danger sources might be. For example, a food processing plant may have input and output tanks and high temperature cleaning systems connected, but not in the same room or area of the factory. It would not be unusual to have to visit several areas of the factory in order to effectively isolate a device for service (e.g., device itself for power, upstream material feeders, downstream feeders and control room). Modern safety manufacturers provide a range of isolation devices specifically designed to fit various switches, valves and effectors. For example, most modern circuit-breakers have a provision to have a small padlock attached to prevent their activation. For other devices such as ball or gate valves, plastic pieces which either fit against the pipe or prevent movement, or clam-shell style objects, which completely surround the valve and prevent its manipulation are used. A common feature of these devices is their bright color, usually red to increase visibility and allow workers to readily see if a device is isolated. Also, the devices are usually of such a design and construction to prevent it being removed with any moderate force. (That is to say that an isolation device does not have to stand up to a chainsaw, but if an operator forcibly removes it, it will be immediately visible that it has been tampered with). To protect one or more circuit breakers in an electrical panel a lockout tagout device called the Panel Lockout can be used. It keeps the panel door locked and prevents the panel cover from being removed. The circuit breakers remain in the off position while electrical work is done. Many sites have the officially stated policy that only the person who tagged the device can untag it. This means that if a worker goes home after their shift without removing the tag from a device which is ready to use, then they will have to travel back to the site to untag it. Giving approval for the removal of a tag over the phone is prohibited. While this policy might seem to be encouraging workers to take the risk of not tagging out in the first place, it is usually accompanied by a policy stating that working on a device without tagging it out will result in instant dismissal. 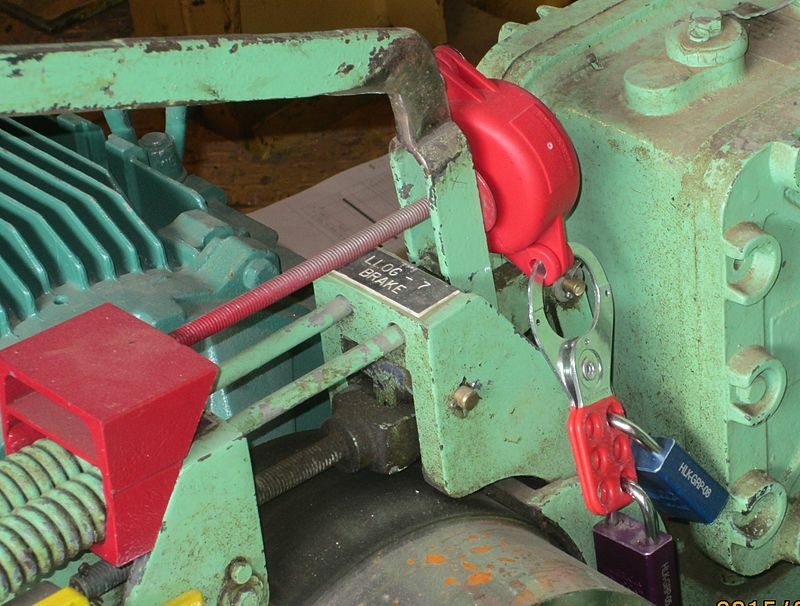 Lockout Tagout is a planned safety procedure that disables the energy supply of industrial machinery and equipment whilst servicing, maintenance work or repairs are in progress. The aim of this system is to effectively protect workers from the dangers created by live machinery or electricity, therefore lowering the overall level of risk when working with this equipment. 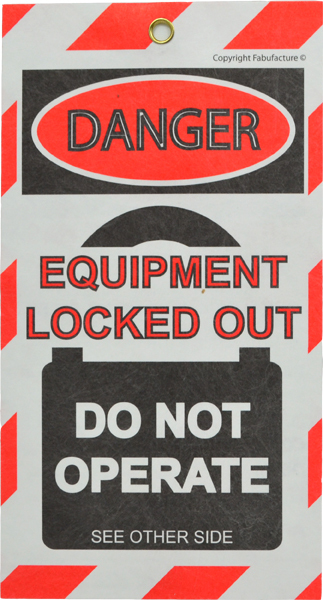 The standard procedure for implementing Lockout Tagout is laid out below. All steps should be carried out either by a single authorised employee or the employer, and company regulations must be followed at all times when implementing the Lockout Tagout procedure. Prepare for a shutdown of energy source. Identify the type of energy used (e.g. electrical) and the potential risks, considering the type and magnitude of the energy and how it can be controlled. Locate the isolator(s) and prepare to ‘lock off’ energy source. Inform any operators and supervisors who may be affected by isolating the machinery and make them aware of the work being carried out. Ensure all affected staff understand the lockout procedure. Turn off the equipment or machine, following established procedures and ensuring that there are no increased hazards from equipment stoppage. Isolate equipment from energy sources, by disconnecting switches, circuit breakers, valves etc. Any stored energy in the equipment should be released, for example by bleeding off pressure, allowing equipment to cool, discharging capacitors, draining lines, or any other methods specified in lockout procedures for individual machines. Lock off all energy sources in the safe/off position, at each isolating device, using the proper Lockout Devices. Apply a lock so no one can turn the switch or valve whilst the work is in progress. Warn against accidental use by attaching lockout warning tags. If several employees are working on the same equipment, make sure each puts in place their own identification label and own safety padlock. When the work is completed take off the lockout/tagout devices and proceed to test, ensuring that all tools and mechanical and electrical lockout devices have been removed. Lockout devices must be only be removed by the person who applied them- if several employees are working on the same piece of equipment, the team supervisor must remove their lockout device last. Warn all workers before re-energising, check the work area to ensure all employees are at a safe distance from the equipment, and restore the energy supply to the machine.